Since 2005/2006 Scripps Reef has been monitored largely through volunteer efforts; field data have been collected, but not scored nor entered into database. Chthamalus/Balanus plots at Scripps Reef consist of relatively dense cover (~65-95%) of acorn barnacles (essentially all Chthamalus dalli/fissus). Several seasonal (spring) declines may have been associated with winter storm damage. Bare rock cover was inversely correlated with the barnacle cover. Pollicipes cover in Pollicipes plots varied only from ~20-35% cover during the monitoring period. 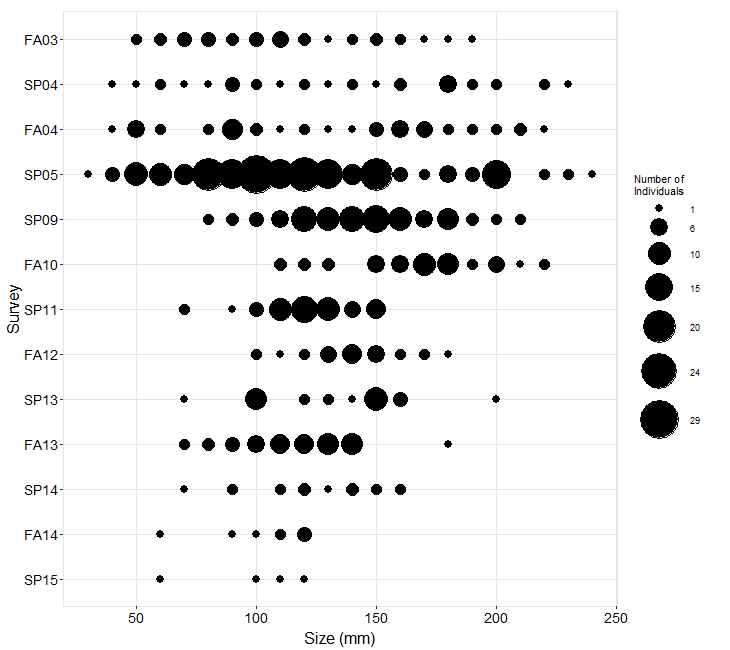 Other plot cover included Mytilus, Chthamalus/Balanus, and bare rock. Mytilus cover tended to vary inversely with Pollicipes cover, and Chthamalus/Balanus cover generally varied inversely with rock cover (especially notable during the 1997-2000 El Niño/La Niña cycle). Mytilus in mussel plots, initially at 80% cover, fluctuated from ~50-90% cover during the monitoring period, with much of the variation due to apparent cumulative storm-induced losses in two plots after Spring 2000, followed by variable recovery. Bare rock accounted for nearly all other cover in the plots and varied inversely with mussel cover. Unlike monitoring sites on Point Loma, mussels at Scripps Reef are common in their zone, with successful recruitment episodes evident over time. Silvetia was not common at Scripps Reef; Silvetia plots were established where patches occurred. Cover, initially ~40%, declined during the 1997-1998 El Niño, then progressively increased to a high of ~75% in 2002, followed by declining values back to ~40% by 2005/2006. At times, there was a slight tendency toward higher cover in fall compared to Spring. Non-coralline crusts and rock constituted most of the other cover in Silvetia plots. 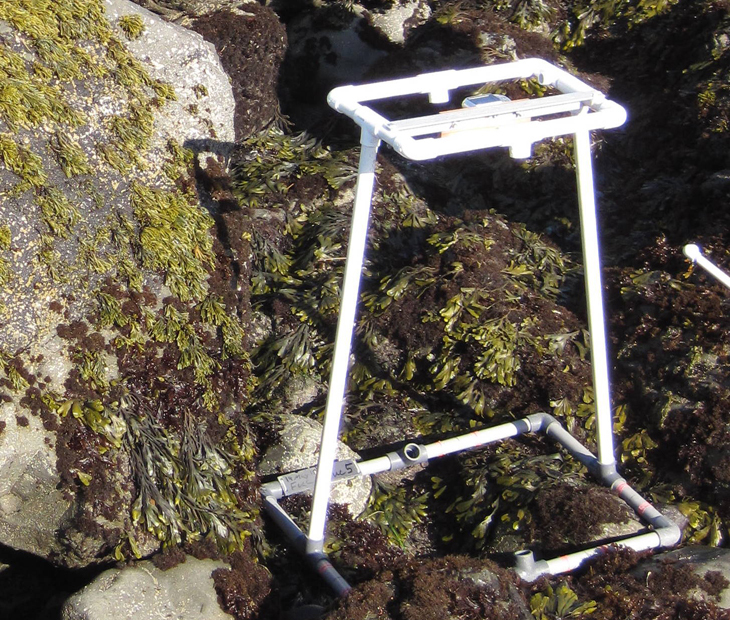 Red algal turf was scored in red algal turf transects until 2001, after which it was scored as more detailed components, including other red algae and articulated corallines. These components combined values continued the relatively high turf cover that existed throughout the monitoring period, except for early in the monitoring when sand tube worm colonies Phragmatopoma (shown as “other invertebrates” dominated, then were removed by El Niño storms to bare rock by Spring 1998. Surfgrass (Phyllospadix) occurred along the wave-swept fringe of the boulder reef, with initial cover ~35%, peak cover ~50% during the 1999-2000 La Niña, and lows ~15% cover in Spring 2002 and Spring 2005. 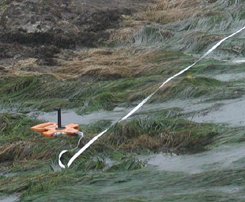 Other red algae tended to vary inversely with surfgrass; note that articulated corallines were separated out from other red algae starting 2002, so the two categories can be combined to reflect total red algae cover. There was a tendency for Phyllospadix to be more common in fall compared to spring seasons. Sometimes in spring surveys, portions of the surfgrass habitat appeared thinned out, tattered, and bleached. These conditions apparently were associated with storm damage coupled with aerial exposure to midday low tides during winter months. Ochre seastars (Pisaster ochraceus) were rare or absent from Fall 1997 to Spring 2003, after which increased numbers were evident, culminating in a dramatic increase from ~50 (Fall 2004) to >200 stars (Spring 2005) site-wide. 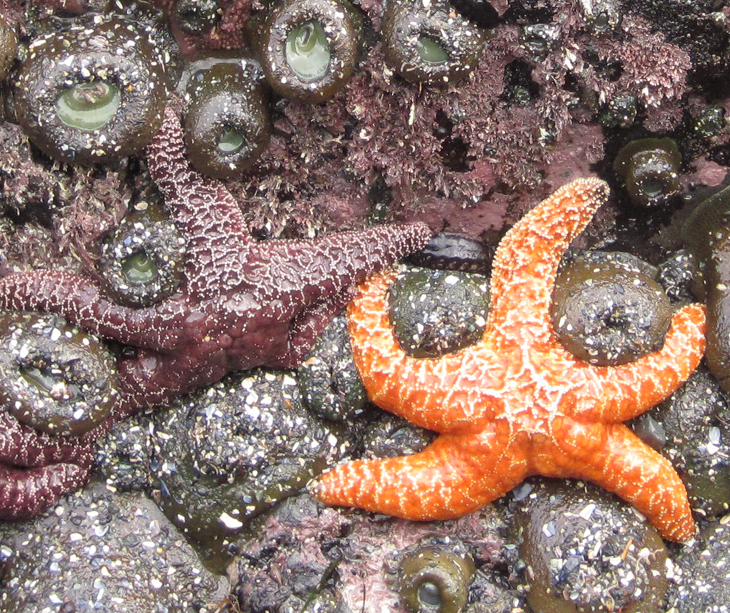 The wide range of star sizes found was not consistent with recruitment alone; it was likely that shallow subtidal seastars migrated into the low intertidal to forage on mussels and other mollusk prey. Southern California seastars experienced catastrophic declines associated with warm-water periods starting in the late 1970’s due to a bacterial “wasting” disease. Some recovery has been evident in recent years, as obviously demonstrated by the greatly increased numbers at Scripps Reef.